Times Two! 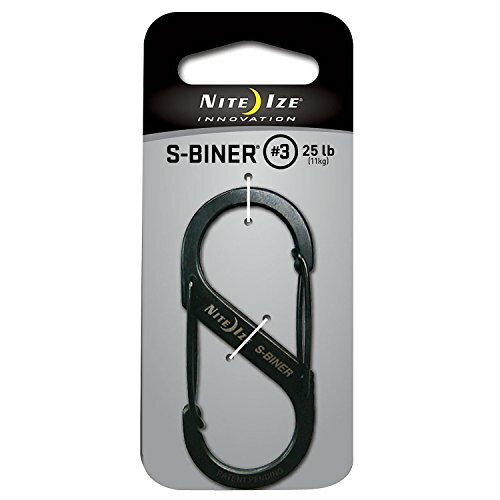 Our unique, two-in-one S-Biner offers functionality for a nearly endless variety of uses. High quality stainless steel constructionAvailable in 5 sizes / 3 finishesSecure stainless steel wire gate closureSize #1 dimensions: 1.56″ x .56″ weight rating: 5 lb.Size #2 dimensions: 2″ x .88″ weight rating: 10 lb.Size #3 dimensions: 2.63″ x 1.13″ weight rating: 25 lb.Size #4 dimensions: 3.5″ x 1.5″ weight rating: 75 lb.Size #5 dimensions: 4.38″ x 1.94″ weight rating: 100 lb. From what type of stainless steel are the S-Biners made?